Passport Photo Place is the preferred New Zealand passport photo service provider in the Greater Orlando, FL area. We take, format and deliver digital passport files and prints as required by the official passport photo specifications for New Zealand Embassies and Consulates. New Zealand has two application options – paper applications and online applications, therefore depending on the application type, we can either print or provide an electronic version of passport photo file. The Department of Internal Affairs (Te Tari Taiwhenua) of New Zealand strongly advises to obtain passport photo photographs at a professional photo studio to avoid rejected applications and lengthy application processing delays. 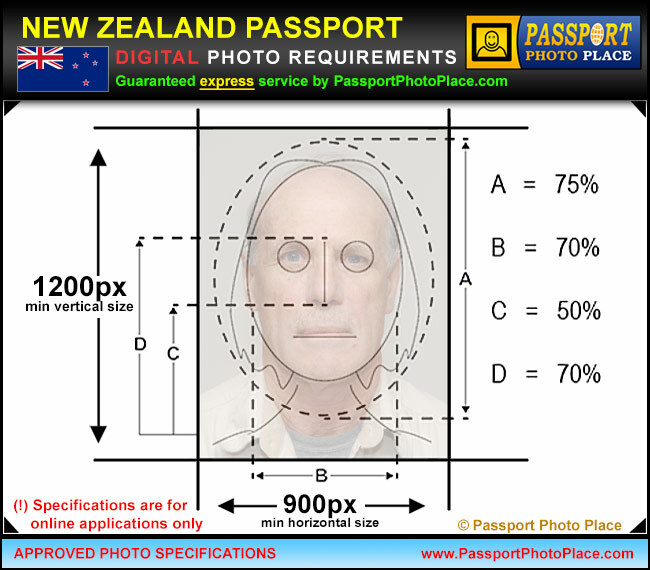 Passport Photo Place takes and prints New Zealand passport pictures that fully comply to the official government specifications by the Department of Internal Affairs. Guaranteed New Zealand passport photograph service. No Rejects! 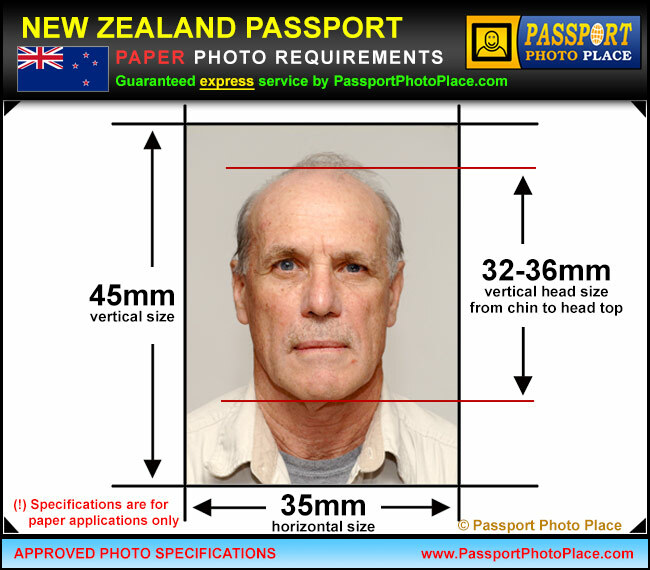 All NZ passport pictures are taken and printed by the strict and recent specifications as provided by the Department of Internal Affairs. All legal document photographs are captured and produced by a professional photographer that specializes in legal passport photography for immigration and travel documentation. High quality and great looking pictures! Passport Photo Place makes professional and great looking photographs that naturally and precisely represent the passport document applicants. We utilized the most advanced photo capture, digital processing and printing equipment to produce outstanding results and guarantee passport photo acceptance by the The Department of Internal Affairs, New Zealand. Passport Photo Place is located in Orlando, FL and all services are rendered on premises. All pictures, digital or printed, are instantly available for customer pick up. Both NZ ONLINE and PAPER passport applications require submitting professionally taken photographs that fully comply to the official requirements. Only full color photographs are accepted. Black and white photos are no longer acceptable. The background must be off-white or lightly colored with no shadows and with proper contrast to between background and the subject. Pictures with white background will be rejected. The photo paper must be high quality and printing quality above 300dpi. The paper coating must have a slight gloss. Inkjet printing is not acceptable for producing a document photographs. Please wear a solid-colored top/shirt. White or slightly off-white tops are not allowed since the background for New Zealand passport pictures is off-white or lightly colored and there must be a strongly defined contrast between subject and the background. Our Orlando, FL Orange County legal photo studio is accessible via major roads and is in relatively close proximity from the following cities: Aloma, Altamonte Springs FL, Apopka FL, Apopka, Azalea Park, Belle Isle, Bithlo, Buena Ventura Lakes, Cambell, Casselberry, Casselbery, Celebration Florida, Celebration, Christmas FL, Christmas, Chuluota, Clermont, Cloud FL, Cocoa Beach, Cocoa FL, Cocoa, Conway, Davenport, Doctor Phillips, Eatonville, Edgewood, Fairview Shores, Fairvilla, Fern Park, Forest City, Goldenrod, Gotha, Hiawassee, Holden Heights FL, Hunters Creek, Kissimmee, Lake Buena Vista, Lake Butler, Lakeland, Lockhard, Lockhart, Longwood FL, Maitland, Meadow Woods, Merritt Island and Cocoa Beach, Mims, Narcoossee, Oak Ridge FL, Oakland, Ocoee, Orlando FL, Orlando Florida, Orlando International Airport, Orlando, Orlo vista, Orlovista, Oviedo Florida, Oviedo, Paradise Heights FL, Pine Castle, Pine Hills, Port Saint John, Rosemont FL, Sanford, Sky Lake, South Apopka, St. Cloud, Tildenville, Titusville FL, Titusville, Union Park, University Park FL, Windermere FL, Windermere, Winter Garden FL, Winter Park and Winter Springs. Getting your 2019 passport and visa pictures at Passport Photo Place is an easy process. We have been providing the legal document photography since 2003 and we know all the quirks and specific situations that help us to provide a reliable, yet convenient and inexpensive service that guarantees the results. Although we serve walk-ins, scheduling your passport or visa photo appointment ensures that you receive the service immediately and without any delays! All passport, visa and other legal document photography service is provided within 15 minutes for most common passport and visa photographs. This includes taking and printing the picture(s). Passport Photo Place accepts all major digital forms of payments. All payments are due at the time of photo session. www.PassportPhotoPlace.com. All content ©2019 Passport Photo Place.